Play your Super Nintendo games with just one cart! No Floppies! No Parallel Cables! No Old Confusing Software! No Power Supplies! 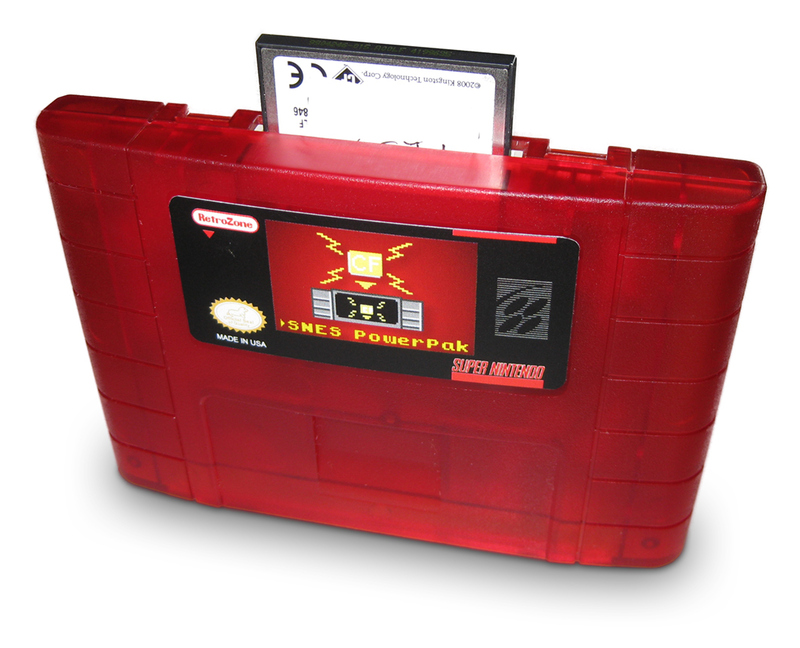 Just copy your games onto one Compact Flash card, insert into the SNES PowerPak, and play! 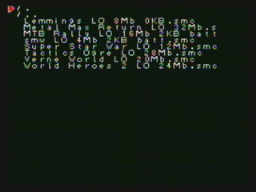 When you start your SNES you get a file browser to choose your game. Then you can load and store battery RAM so all your saved games stay saved. Save files can also be transferred to and from your computer for use with emulators. Built in Game Genie code support lets you use 5 cheat codes at once. SDRAM and DMA are used for fast game loading so you can play in seconds. This means a quick cycle for homebrew development. Now you can see your creation on real hardware instead of relying on emulators. In cart support for the DSP1 chip lets you play games like Super Mario Kart that are missing from some other SNES products. Huge 128Mbit memory means even the largest games can be played without buying hard to find memory expansions. Versatile memory mapping runs games correctly without FastROM hacking or RAM mirroring problems. Unlike all other flash carts the SNES PowerPak includes the Super Ciclone chip so consoles of all regions are supported. 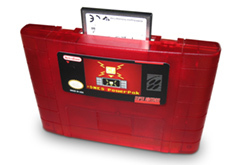 Standard FAT16 or FAT32 formatted carts are used so there is no special software to load games onto the card. Organize your games in folders any way you want for faster browsing. Compact Flash is used instead of something else like SD for maximum speed. The SNES processor is the bottleneck so the parallel CF card is around 10 times faster than the serial SD card. The entire PowerPak system is updateable for future additions and bug fixes. All loading files are stored on the CF card for easy upgrading. Just download the most recent Mappers file below, unzip, then copy the folder to the root of your CF card. The boot ROM is socketed for easy reflashing but this will hopefully never be needed. If it is needed and you do not have a programmer, you just pay the shipping to get your SNES PowerPak here and I will reflash then mail it back free. 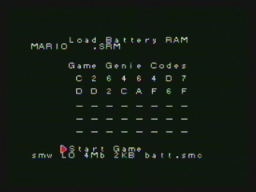 The CF Card option includes a formatted CF card with the required SNES PowerPak files already loaded. No games are on the card. The USB Card Reader option includes a USB card reader so you can load your games from your computer on to the card. Works on full size Super Nintendo and Super Famicom systems from both NTSC and PAL regions. Works on the Nintendo SNES mini, aka SNES Jr.
Other clones untested, likely to work. Games that use expansion chips other than the DSP1 are not supported, and will not be added. File display does NOT sort alphabetically. Sorting would slow down file browsing. Use a drive sorter app to sort files on your CF card.